Even the newest Queen City transplant is privy to the University of Cincinnati’s top-ranked DAAP and engineering programs. Executive offices across town are filled with UC law and business grads. Everyone has a Bob Huggins story. But most local lifers likely have no clue that the city’s preeminent school of higher learning is also a magnet for some of the country’s top aspiring writers and poets. New York and San Francisco had the Beat Generation. Dublin had Yeats, Joyce, even Bono. The Iowa Writers’ Workshop is famed for churning out the likes of Flannery O’Connor and John Irving. But Cincinnati? In 2012, the last year the nonprofit literary organization Poets & Writers compiled national rankings for Ph.D. creative writing programs, UC was ranked by applicants as the eighth-favorite in the nation. That same year, the program’s biannually published literary journal, The Cincinnati Review, tied The New Yorker for the greatest number of poems selected for republication in the annual Best American Poetry. (One-tenth of the anthology was drawn from CR.) This fall, faculty member Chris Bachelder’s book, The Throwback Special, was short-listed for the National Book Award. When I first e-mailed Michael Griffith, director of graduate studies in English, asking for insight into successes by current students and recent alumni, he sent back an eight-page bibliography listing novels, story and poetry collections, and conference speaking engagements. It’s an elite program. In 2012, roughly 60 people applied for three poetry and three fiction spots in the creative writing Ph.D. track. Last year, 115 applicants vied for those six spots, plus an additional spot in a newer nonfiction track. Of course, all of this transpires in the academic and publishing worlds, a mini-universe not lacking in self-importance, pretension, and careerist maneuvering. Even if the program’s prowess (or mere existence) is news to most, one would be forgiven, in the midst of so many accolades, alumni book contracts, and steep competition for admission, for presuming it’s a program where ambition rules and ego drives the classroom. Instead, it’s a surprisingly prima donna–free environment where collegiality reigns and the focus is on improving each person’s quality of work, rather than one-upmanship. And in the dog-eat-dog halls of academe, that counts as a major plot twist. On an autumn Tuesday afternoon in McMicken Hall, the school’s hub for creative writing, nine students gather around a large wooden table for Bachelder’s graduate-level Technique and Form in Fiction class. By appearance, they are predominantly in their twenties and thirties, mainly white. Most are women. There’s only a single pair of Warby Parker-type glasses in the bunch. The focus of Bachelder’s course is on forms of haunted narration, how being dogged by memory, obsessions, or guilt can serve as a dramatic device in a story. It’s second-year Ryan Smith’s turn to summarize and prompt discussion for the week’s reading: Jeffrey Eugenides’s The Virgin Suicides. Smith gamely dives into Eugenides’s strange first-person plural why-done-it, sweeping through the premise of the novel to dig deeper into why the story’s constructs work. An aspiring novelist, Smith draws the class to a section of the book in which a grieving, frustrated father tries to flush a neighbor boy’s retainer down the toilet. The thing won’t flush, a scene representing futility and ineffectuality. “The replica of the boy’s mouth clung to the white slope,” Smith reads aloud. A few smile over the line, which Bachelder repeats, telling his students to do that—write sentences like that simple, rich line—then do it again and again. There’s a respect for craft in the room that transcends the usual dynamic of protégés and esteemed professor, or even the worshipful attitude that can often occur among creatives admiring a great work. The Ph.D. program is equal parts training in writing and training for future academic life, so perhaps some of the program’s inherent un-jerkiness comes from assembling a group of future pedagogues keen on fostering growth in others’ writing as much as their own. Seven of the class’s 10 students are on the Ph.D. track, and the majority of them already have a Master of Fine Arts degree as well. Once considered the terminal degree in creative writing, an MFA is now often seen as a “studio” degree for those who want to write full-time. Smith’s day leading discussion is yet another form of practice for a professorial career. Ph.D. students at UC teach one class per semester (such as freshman composition) in their first year; in their second year they lead undergraduate writing workshops, literature courses, or creative writing courses they propose (like Smith’s upcoming playwriting workshop). All graduate students in the creative writing program are fully funded through teaching lower-level courses or working for CR and other university fellowships—unless they have funds provided from some other source, such as tuition remission or the GI Bill. 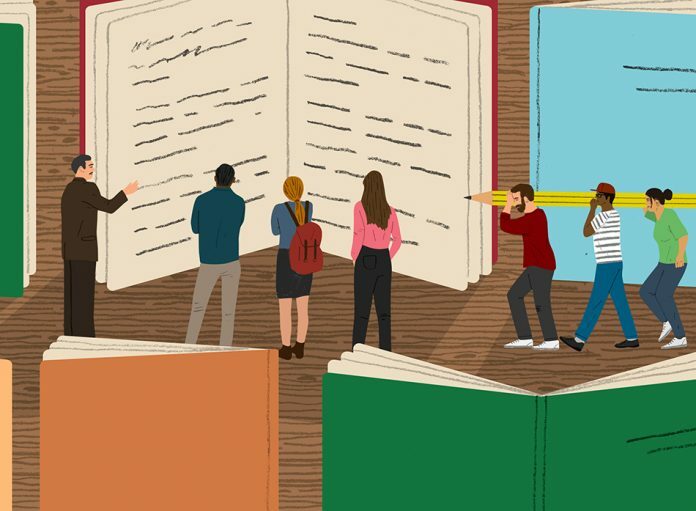 Cultivating this type of artistic ecosystem has enabled UC to attract some pretty high-quality literary talent, among both students and faculty. The university’s George Elliston Poetry Fund has drawn a distinguished poet-in-residence to campus each year since 1951 for seminars, workshops, and public readings; past residents include Robert Frost, Wendell Berry, Marilyn Nelson, and C.K. Williams. Biannually, the Emerging Fiction Writers Festival brings four burgeoning writers to campus, and each semester the program’s visiting writers series attracts highly regarded poets and novelists. The Cincinnati Review, which began publication in 2003, receives upwards of 10,000 poetry, essay, and story submissions every year from a mix of young writers, Pulitzer Prize winners, and MacArthur fellows. “CR really has been a big part of the efflorescence of the program over the last 15 years,” says Griffith, adding that the journal made outsiders consider UC a creative writing hub. Those layers of support, and the reputation the program has built, are certainly welcome and embraced, but also reflect a harsh reality: Part of the reason UC’s creative writing program is so competitive is because in today’s literary climate, a Ph.D. and published work are both tacit requirements for landing a tenure-track job. Katherine Zlabek graduated from the program in 2014 and recently started a new position at Salisbury University in Maryland. Before graduation, she had a series of job-preparation meetings and a number of mentors who scrutinized her applications. She says that “people do recognize [UC] as a school that prepares students well.” Stewart, the creative writing director, has been on the job-seeking end of the equation before, hunting for a position when few were available. She was fortunate UC had an opening the year she was looking, though it’s not merely a lack of opportunity that keeps her rooted here. She refers to the program’s congeniality—again, that vibe—but also a university that is generous with fellowship opportunities for students and faculty. According to Seth Abramson—the poet, essayist, and Harvard-trained lawyer who compiled those MFA and Ph.D. rankings for Poets & Writers—we are living through an important inflection point in the professionalization of creative writing. He gauges it as the fastest growing field in the humanities—a 262 percent growth in the number of terminal-degree programs (MFA and Ph.D.) since 1993—but also notes the dramatic sea change in how MFAs have come to be regarded. Flooded with applicants for a vanishing number of teaching positions, Griffith says universities end up “looking to make minuscule distinctions.” There’s a mild preference for Ph.D.s, even among those who’ve published one or more books, because the additional four years allow writers to amass more impressive CVs and prepare to teach multiple genres. The same goes for those seeking jobs outside academia as archivists, editors, or publishers—at UC, for example, they can pair the degree with, say, one of the three assistantships editing The Cincinnati Review or working for its forthcoming press, Acre Books, launching in 2017. It yields results, too. Griffith notes that more than two-thirds of UC’s creative writing alumni from the last decade secured tenure-track, long-term, or permanent academic jobs within two years of graduation. A tenth had adjunct or contingent academic positions, and the rest have jobs outside academia. For a field that holds its more storied institutions in higher esteem, it’s a good position to be in. Six poetry students sit in a circle of desks as instructor and poet Rebecca Lindenberg reminds her class that novelist Sandra Cisneros will be reading on campus, just days after accepting the National Medal of Arts Award from President Obama. Lindenberg herself has published two collections of poetry, including The Logan Notebooks, winner of the 2015 Utah Book Award. It’s near lunch hour, evidenced by the wrapped sandwiches and fruit littering the students’ desks and the Lunchable and Diet Coke on Lindenberg’s. Each student assesses a copy of Lyn Hejinian’s My Life, a dense, autobiographical, poetic assemblage of 37 sets of 37 sentences, reflecting the first 37 years of Hejinian’s life. They grapple with what to make of a text that Hejinian treated as a feminist project, bucking the tyranny of hierarchical narrative by attempting to make no line more important than another. The class is with her, chuckling and delighting in the good and strange they garnered from the reading, appreciating how the off-putting structure still conveyed something powerful. There are beautiful lines (“It is hard to turn away from moving water”) and curated oddities (“McDonald’s is the world’s largest purchaser of beef eyeballs”), which the students read aloud. They discuss what it’s like to take risks on as grand a scale as Hejinian, and to what degree poets such as themselves can take such risks in the current culture. There’s a sense and understanding of the rarified in the room, contemplative and supportive. The tall odds of book publication and job openings in a tightening, niche market loom over everything, but in a manner that inspires rather than impedes creativity and camaraderie. The students are fortunate enough to be practicing for greatness in a place where great work is fostered, celebrated, and groomed. There’s no room to play it safe. They can’t afford to.